CU Services LLC is a user friendly program for the analysis of duct systems transporting air or gas. It is designed to work with gas at any temperature and pressure. The duct can be of any roughness and can be circular, rectangular, or oval. Flow units can be either lb/hr or acfm.  Sizing Mode: For a duct with a known flow rate, the program will determine the dimensions and area required based on one of two criteria: The desired loss per hundred feet or the desired velocity.  Performance Mode: For a series of interconnected, pre-sized ducts, each with a known flow rate, the program will calculate the velocity, pressure loss, velocity pressure, the cumulative loss, the unbalance, and the static regain for each duct and for the complete system. 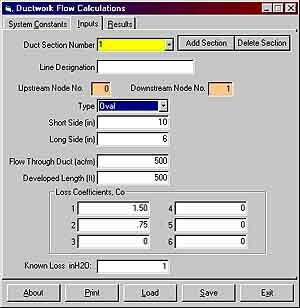 The program will display and print the results in either a tabular view for the system or in single form for each duct.